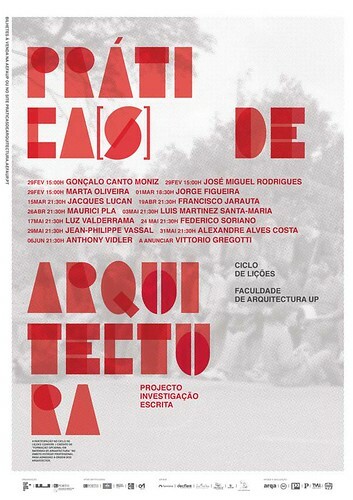 Facing the historical condition of a place, of a particular community – Porto –, we will take as reference the “common adventure followed by three personages” – Fernando Távora, Álvaro Siza, Eduardo Souto de Moura – and by a variable circle of friends. An experience that has shared, that still shares, the dream of rescuing Portugal from its isolation and, at the same time, not to renounce to its historical identity – projection of a practice of architecture that has released itself, that still does, from the historical forms, but not from the deep character of its culture. Sign and sediment of a non linear identity, perhaps they are just the gathering of gestures of simplicity of those who search (searched) process and score for raising the culture of the place, for the transformation of a landscape – unrests of the art of their house-mother: Architecture. Architecture that is not but a way to learn how to modify the circumstance, creating a new circumstance – it was, it has been, principle and experience, manifest and space of a minimal complicity to (a)firm a project for the craft of architecture, extended, transported and translated, without any big creative distance but with magic conviction, as a festive atmosphere, as installer embrace of school practice. Practice gently cultivated as hospitable and plural school in the evolution of the “territory of architecture”. But in the agitation of that condition or in the intelligibility of that process, we have granted that the steps of today or in the near time will intersect, cross, touch different confabulations and derivations, crossings and deviations. Today, we know it quite well, that adventure serves a lot of many other hospitalities, from many other places, from many other practicable of knowledge and drawing, of study and investigation, of teaching and learning. This means that, in reality, “to make a project is to build an object-subject distance in order to, in this distancing, invent ourselves and, simultaneously, the project”. Today, it is perhaps instructive and operative to accept that project, research, writing are problemtic stations in the agitation of the argument and in the manifestation of sense of the brand “School of Porto”. Aiming the mobility of the meanings and the complexity of the materials offered to the construction of architecture, how could we creatively serve the destiny of architecture as expression and physical projection of the imagination, as experimentation and experience, as knowledge and happening, without subverting its “adventurous coherence” by the arbitrary and abusive manipulation of the complexity of the materials that organize it?